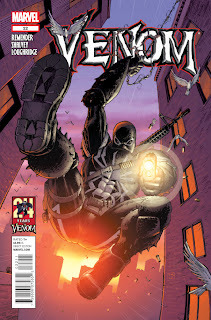 My final issue of Conan will be out in February but never fear, my next arc of VENOM starts in February with #31. 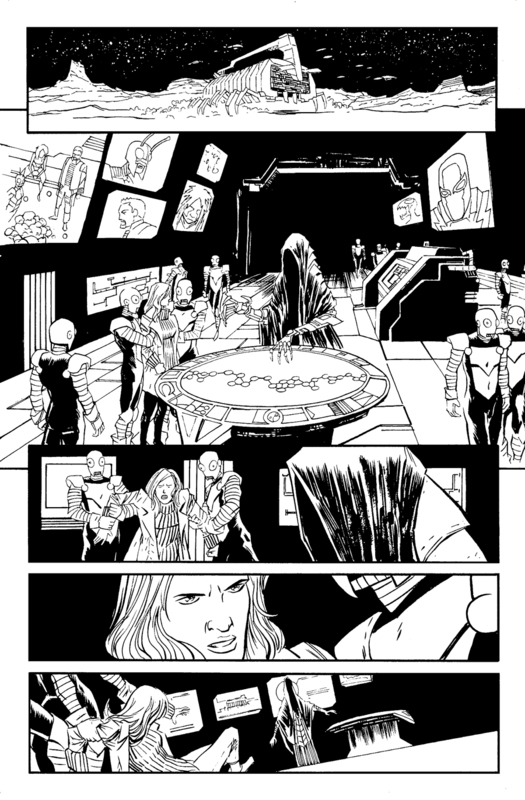 It's part one of a 5-issue arc, so I'm really looking forward to telling a longer-form story. It'll be a nice change from the shorter 2 or 3 issue arcs I've been doing for the last couple of years. Seems I've gotten popular in my neck of the woods. Just found out that I was awarded 'Best Published Mainstream Irish Artist' and was named in the 'Hall Of Fame' in this year's ICN AWARDS. The awards are for Irish comic creators, so of course it's great to know that so many folks at home are supportive of myself and my work. Thanks to all who voted for me, it is very much appreciated. OUT TODAY! 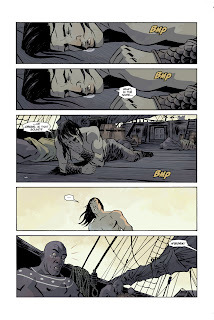 CONAN #10! 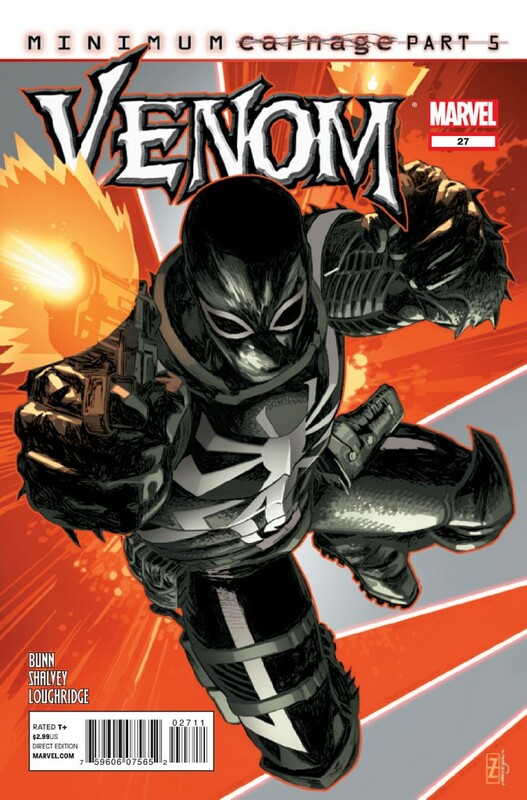 VENOM #27! Yes indeed, I have TWO new books out today. First up, CONAN #10. This is the first part of 'The Death'. 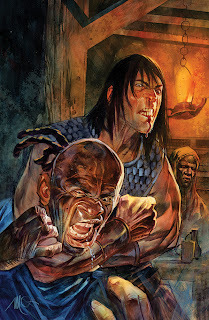 It's a very different Conan story and I hope you all like it. 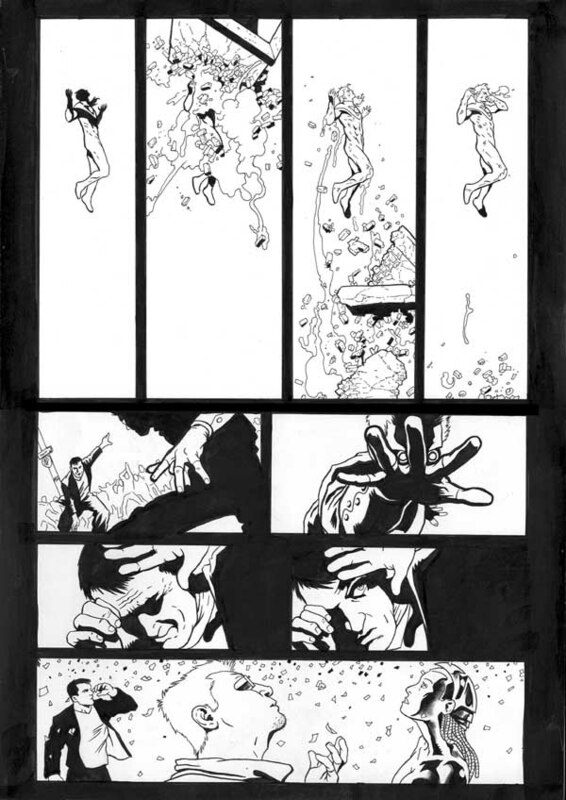 Got to work with Brian Wood again, which really seems to bring out the best in my artwork. 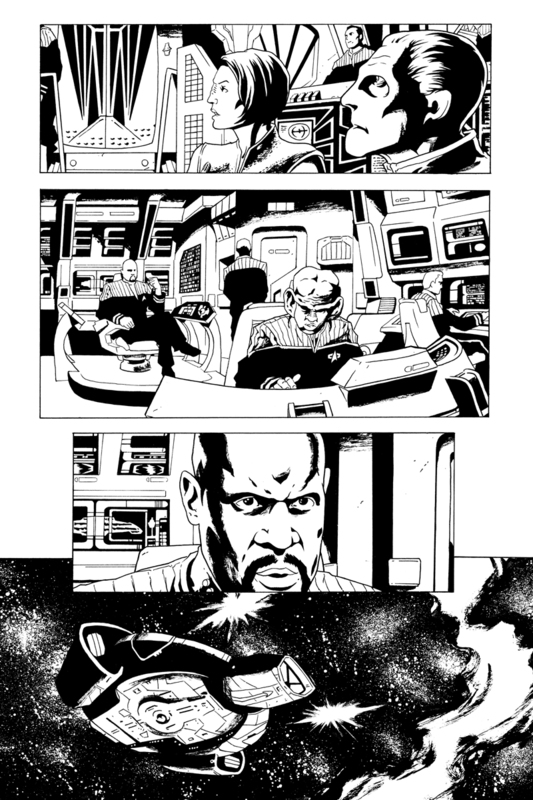 Also, I got to work with the amazing Dave Stewart on colours, which was a dream come true. Also, VENOM #27, which is the penultimate chapter of the MINIMUM CARNAGE crossover. Got to draw some crazy, crazy stuff in this issue. 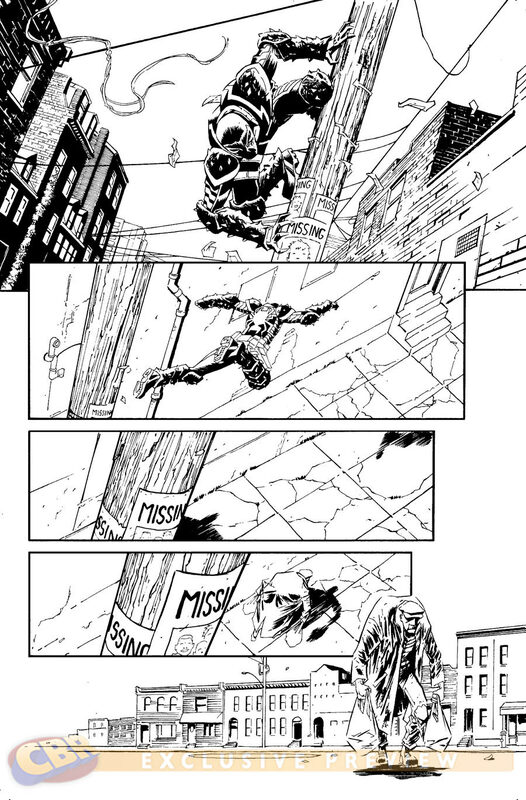 It's absolutely mental stuff from writer Cullen Bunn. 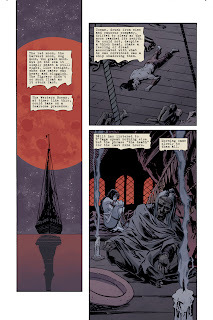 Lee Loughridge on colours did his usual excellent job. Make sure you pick them BOTH up from your local comic book retailer, or on Comixology. 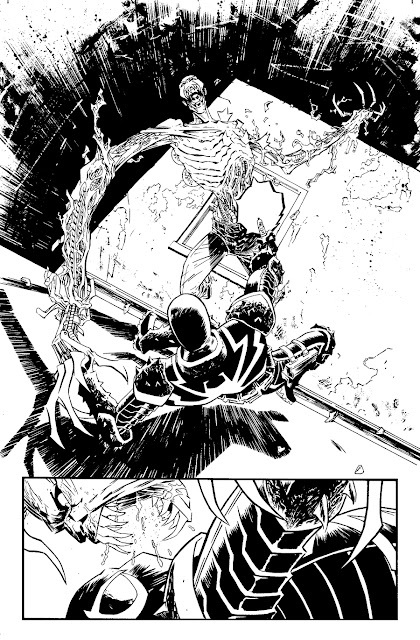 Preview pages for VENOM 27 went on line this week. Above are my black-and white pages. Go here to see the excellent Lee Loughridge colours. 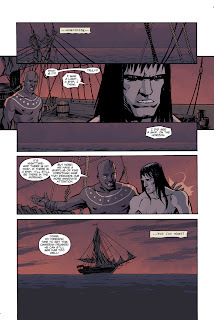 Dark Horse released a preview for CONAN #10; my first issue with the incredible team of Massimo Carnevale, Brian Wood and Dave Stewart. For me, it's like a Northlanders reunion with a different colourist, who happens to be also another of my absolute favourites. 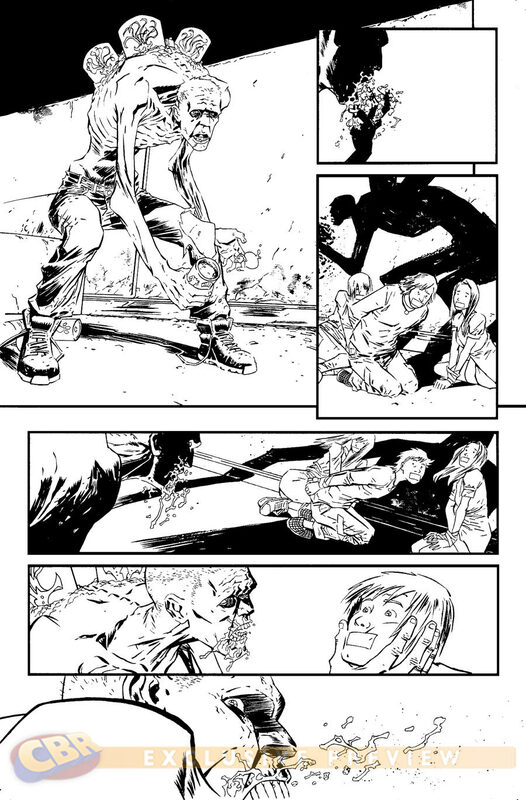 As you can see from the preview; Stewart's work is amazing. So happy to get the chance to collaborate with him. In a couple of weeks I will be attending the wonderful Thought Bubble festival for the second time. This time however, I won't have a table of my own. 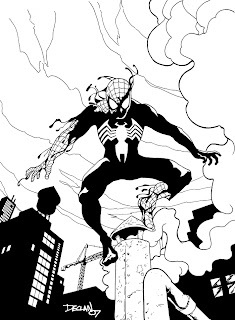 Instead, I will be signing and sketching from 1.50 to 3.20 on both Saturday and Sunday at signing table C. It will be first come, first serve so make sure you get there early. Hope to see you all there! 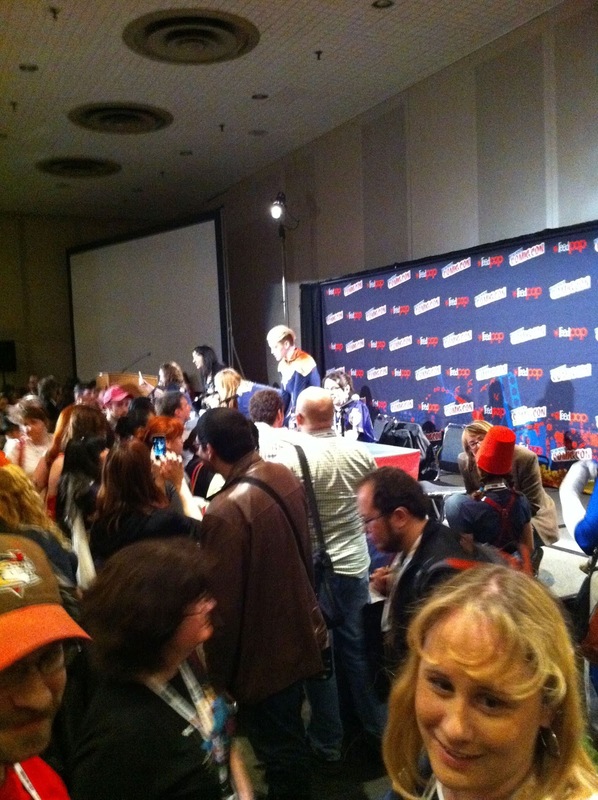 I previously mentioned that I was at New York Comic Con. It was quite the experience! 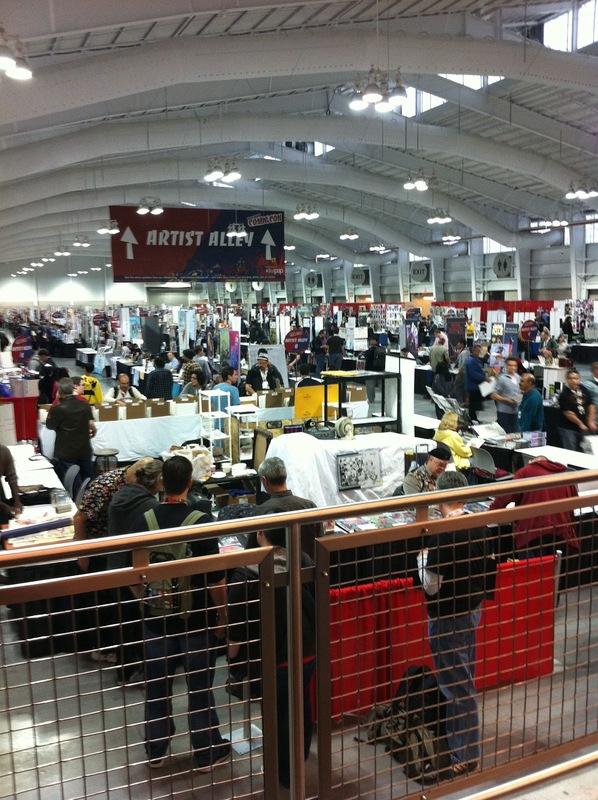 So much so I thought I'd do a convention report much like I used to do back in the old days. It was a relief to get back to artist alley where it was certainly quieter than the main show, but was still plenty busy. There was a lot of business happening there, but you could still take a breather and talk to fans and fellow pros. 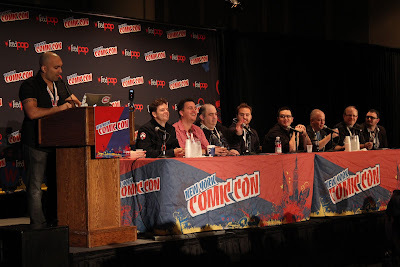 I got to chat with Rick remender and Deadpool writer Gerry Duggan who were sitting next to me, both really sound guys. I got a change to look around artist alley a good bit too, so got to meet/catch up with lots of friends including old roomies Ricardo Lopez Ortiz and Stacey Lee. Saturday was even busier than Friday. Jordie came to the show with me and proceeded to completely disappear for most of the day! Everyone was looking for her and stealing her away from me all day. We took a brief walk into the main show hall and it was just unbearable for me. It was a pretty busy day of commissions so didn't get as much of a break. Met a great Winter Soldier cosplayer though; Gerry Duggan sent me this photo with him (with Winter Soldier editor Lauren Sankovich in the background). 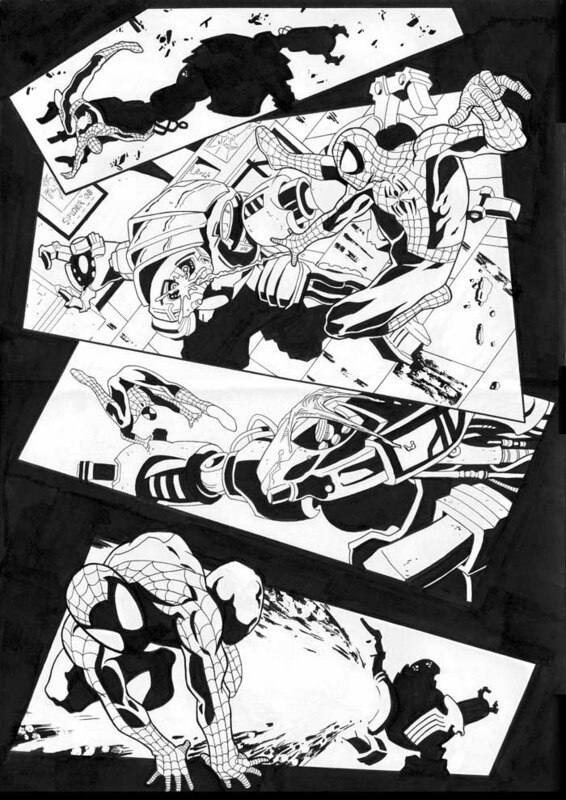 Sunday was a bit of a change as I was on the Amazing Spider-Man Panel first thing in the morning where I quite publicly stole a dollar from Mark Waid. I'm depending on my ability to be forgetful as a way of getting away with it.. It was really weird to be up there with all those established pros... I was sitting next to Mark Waid for godsake! Moments like that really remind me of how lucky I've been over the last few years. 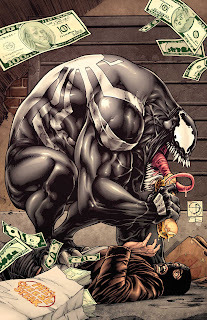 Got to joke a bit and tease what's coming up in Venom. Got to meet Venom writer Cullen Bunn too and chat about what was coming up in pour next arc, and even got to suggest a few things, so I'm really looking froward to draw all that stuff. It was a very interesting panel. I really wish there wasn't a need for 'Women in Comics' panels as ideally, comics would be equally populated by both sexes but to this day it is totally skewed towards us guys. The panelists all briefly described how they all broke in though various means and moved quickly to questions from attendees and also twitter. While listening to all the questions it became clear that there were plenty of female fans at this panels who really appreciated that their voices were heard. 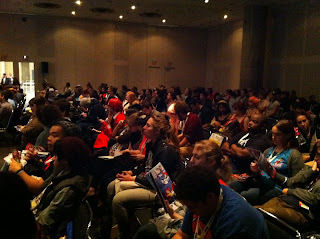 Once it had wrapped; the panelists were swamped with one-on-one questions. It was really encouraging to see so much interest from female fans in female creators. I would argue that it is panel such as these Women In Marvel panels that invest in the female fanbase and will over time, develop into a more equal gender balance in the creation of comics. The rest of Sunday consisted of brief hellos and goodbyes. The great thing about NYCC is you get to see so many friends over one weekend. the downside is that you rarely get to spend as much time with them all as you'd really like. A perfect end to the weekend was pizza in Brooklyn with old friends. 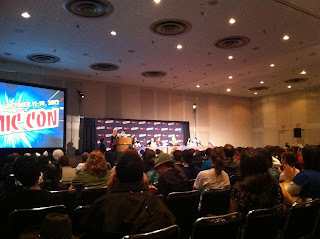 NYCC 2012 was a fantastic weekend for me. Got to catch up with a lot of friends, return to the city that feels like a second home, and talk about some interesting future projects. Was particularly happy to see Jordie do so well at the show too. Between her panels, and her signing with Jonathan Hickman, and with the flood of people looking to meet her, It's amazing to see her career take off in such a big way in such a small space of time. Can't wait for NYCC 2013! Back from NYCC! And what a fantastic time I had. Back to the studio now to get started on new projects. 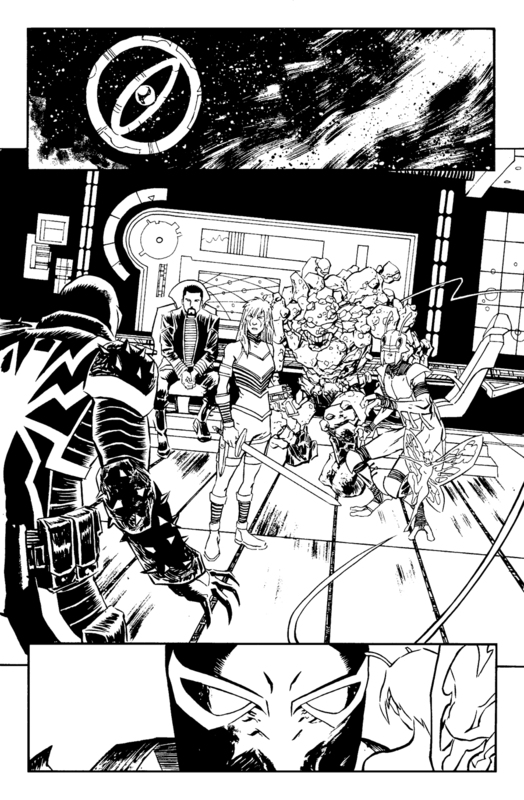 I see that VENOM #26 is out tomorrow. It's part 3 of Marvel's MINIMUM CARNAGE event and also my first issue with SIXTH GUN writer Cullen Bunn. Make sure you pick it up; it's full of sci-fi crazyness. You can see a fully coloured and lettered previer over at CBR. It's that wonderful time of year; New York Comic Con is fast approaching; only days away in fact. If you're looking to get a commission, signatures, or just looking to say hello, just swing by table K2. Just look for the long que of people..... for Rick Remender, who's table is next to mine. 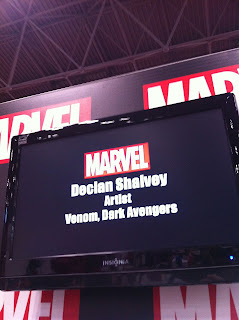 I'll also be signing at the Marvel booth from 1-2pm on Friday. And be sure to check out the Spider-Man panel from 10:45-11:45 on Sunday, where I'll be on stage talking about Venom. I'll be taking a limited amount of commissions at the show. I'm planning on only doing 8 commissions a day and I'm not taking any pre-orders, so make sure you get to me early to get on the commission list. 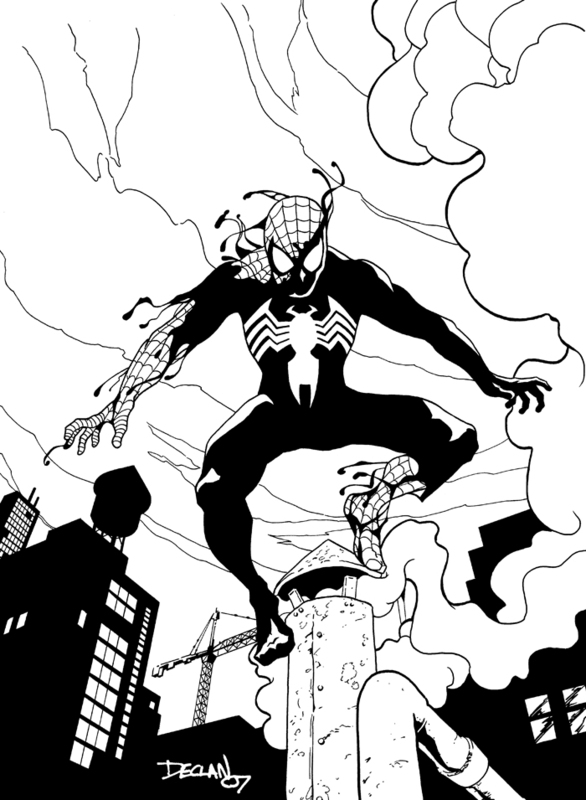 Commissions will be $100 for 7.5 x 11' fully inked piece. Hey all, DICE is finally here this weekend and it's a cracking line up. A fantastic guest list with some of the best in mainstream and creator-owned comics with top-name talent from the US, UK and of course, Ireland! 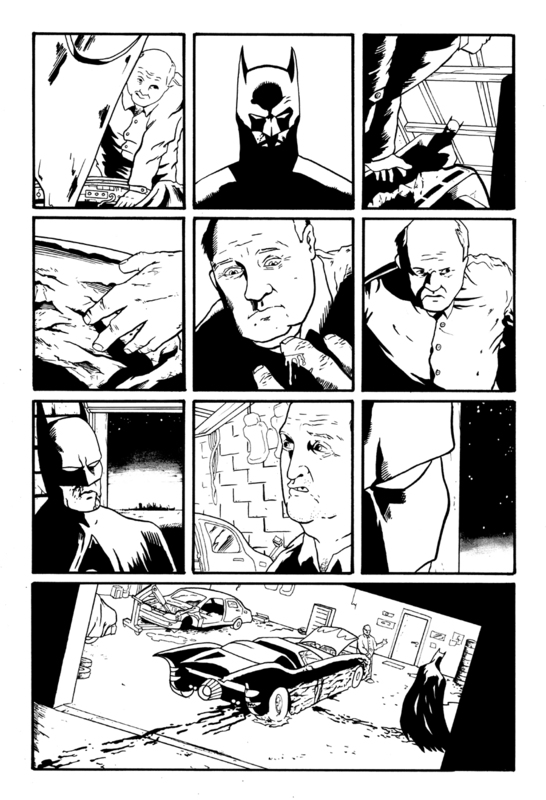 Prints of the above Batman piece will also be available at the show too. Not sure how they're being handed out, but I know there is a very limited amount available, so make sure you get to the show early to get a copy of this EXCLUSIVE print. 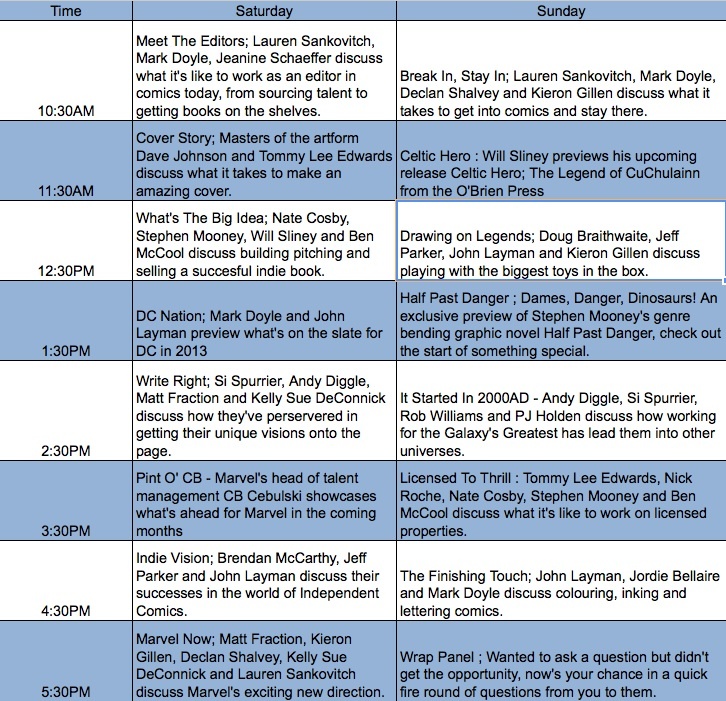 Here's the panel schedule too; it's a great group of talks; I'm not sure how I'll find the time to draw this weekend as I really want to see all these. 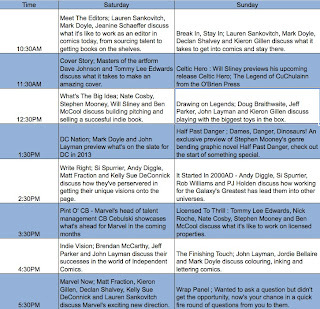 I'll be on 2 panels; The 'Marvel Now' panel on 5.30PM Saturday and the 'Break In; Stay In' panel at 10.30AM on Sunday. 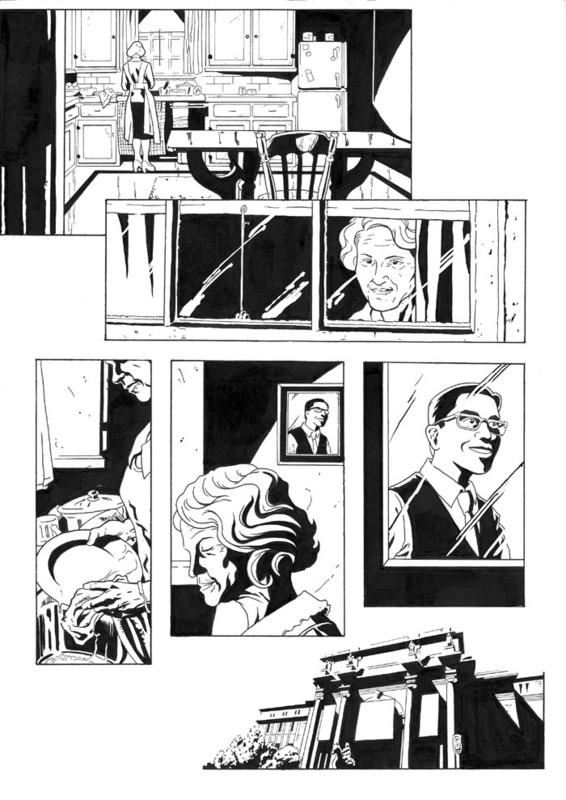 I believe I'll also be moderating the Half Past Danger panel at 1.30PM on Sunday too. 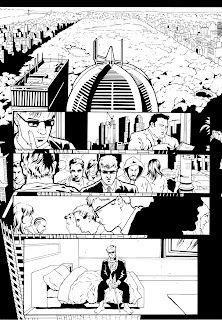 I'll be quizzing writer/artist Stephen Mooney about his this new series along with colourist Jordie Bellaire and I believe there will be a very special announcement too. Make sure you don't miss that one. Here's directions to the venue and tickets are available here. Hope to see ye all this weekend! 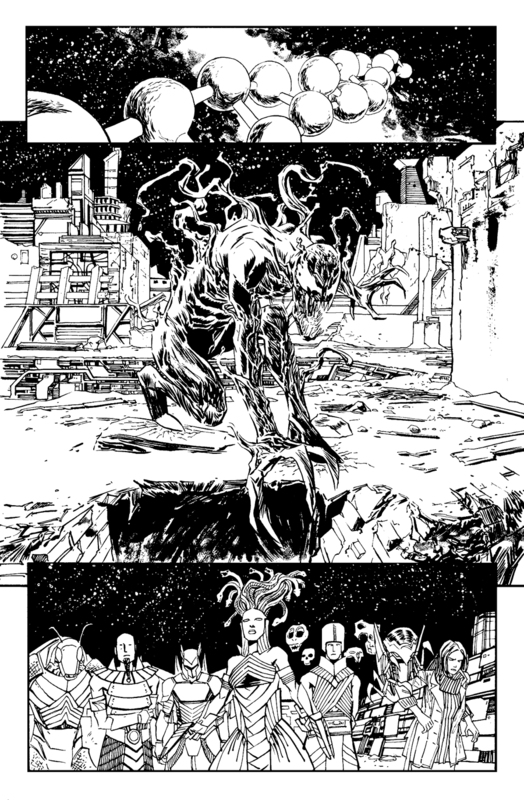 Marvel released some preview pages from my next VENOM issue which is part of the upcoming 'Minimum Carnage' crossover. 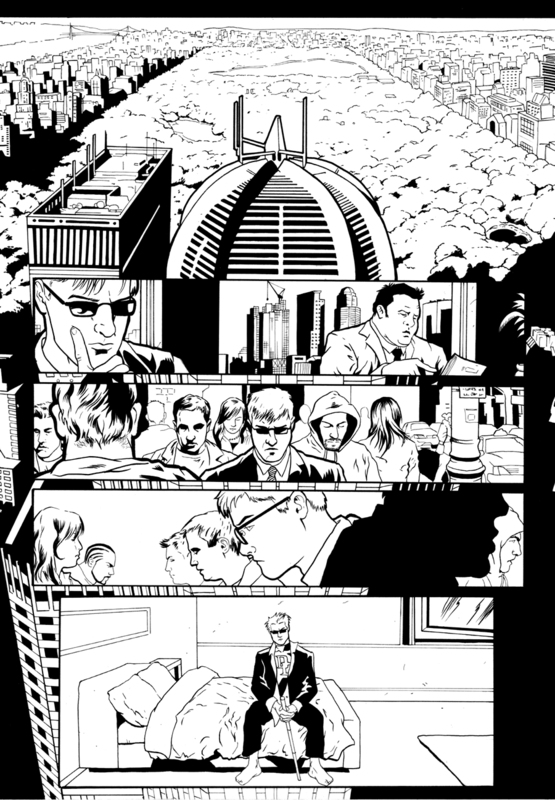 Really happy with the issue; it's got some crazy, crazy stuff happening. 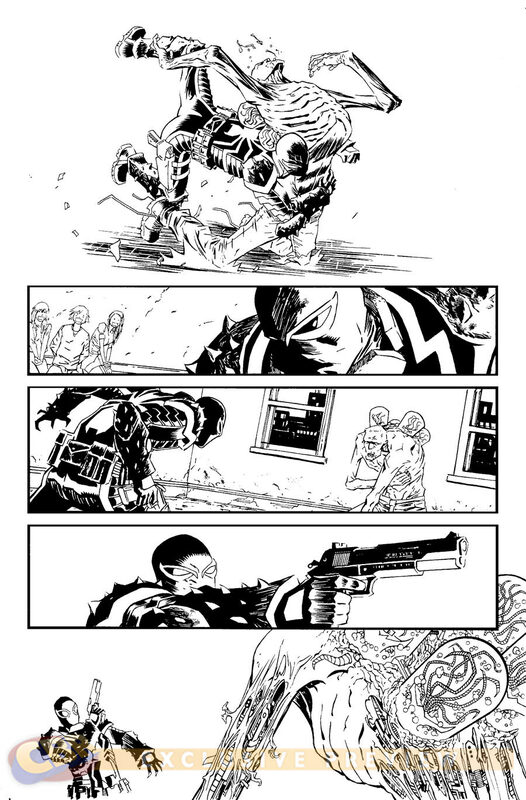 Above are my inks, but make sure you check out Lee Loughridge's great colours on these pages over on VENOM writer Cullen Bunn's tumblr. 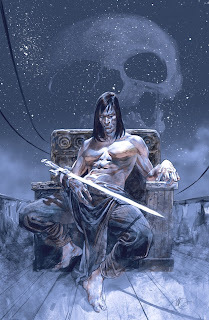 Just saw this fantastic cover to CONAN #11 online, along with some info about the issue. 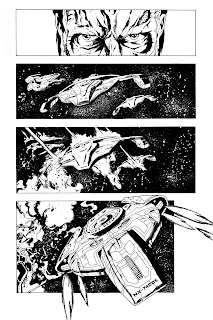 I've just finished my run on the book for Dark Horse; can't wait to see it in print at the end of the year. 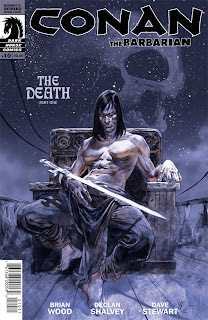 Brian Wood introduces Conan to a kind of fear he’s never experienced, in part two of “The Death”! After the salvage of a derelict ship, a terrifying illness spreads swiftly throughout the Tigress, felling Bêlit and her entire crew. Healthy but fearful of losing Bêlit, Conan seeks help in a nearby town, where the welcome he recieves is just as deadly! 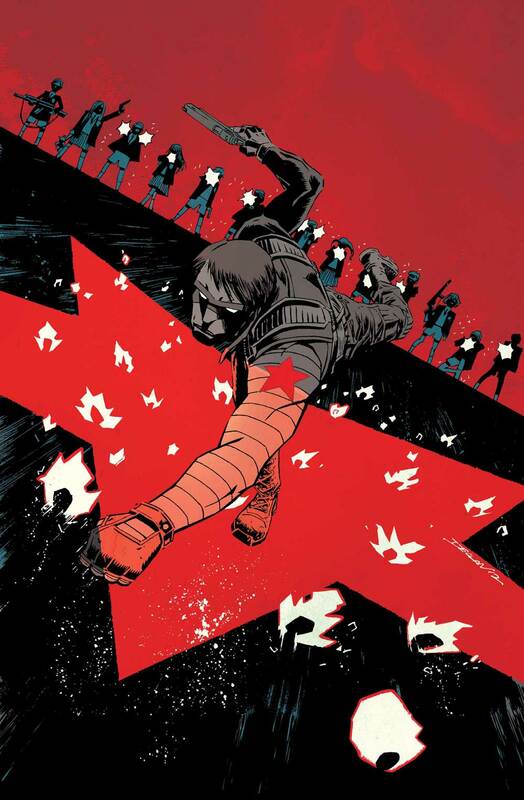 From Brian Wood (Northlanders) and Declan Shalvey (Dark Avengers)! The most acclaimed Conan comics in years! 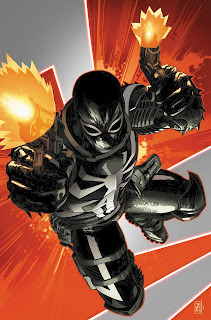 Had a pleasant surprise last week when I saw the trade paperback for THUNDERBOLTS: LIKE LIGHTNING was on shelves. It contains the 'T-Bolts v T-Bolts' arc I drew, which was technically the last arc of the book before the switchover to Dark Avengers. 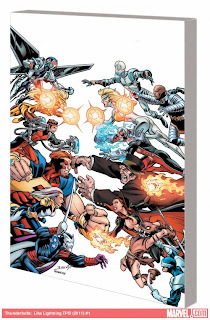 It also has extras, like the illustrations of the original T-Bolts I did, as well as writer Jeff Parker interviewing those responsible for the creation of the book; writer Kurt Busiek, artist Mark Bagley and editor Tom Brevoort. I'm really proud of this book, so I suggest you all go pick it up. It's available in all good comic shops, book shops, and Amazon. 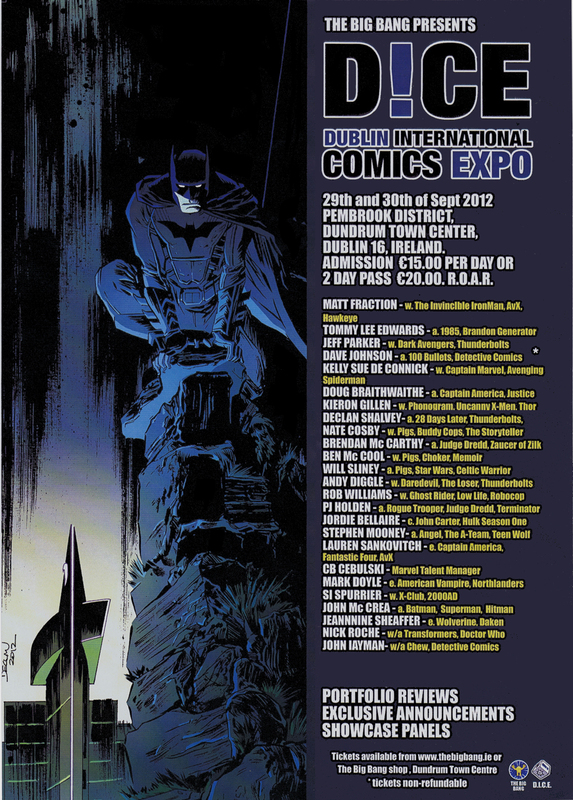 In less than 30 days from now, the Dublin International Comics Show (DICE) will take place in Dundrum. I'm really looking forward to it; some of my favourite people will be there and I include myself in that. For one, I live extremely close to Dundrum Shopping centre so it will by far be the most convenient comics show I'll ever attend. 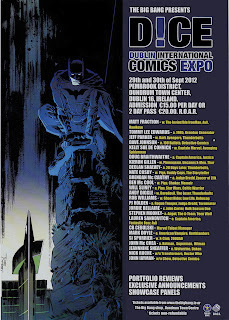 Also, it will be the first Dublin show I'll have attended since I broke into mainstream comics. The DICE organisers have had Dublin shows in the past that I attended as a wannabe artist and this will be my first as an established professional, so it's going to be a special show for me personally. 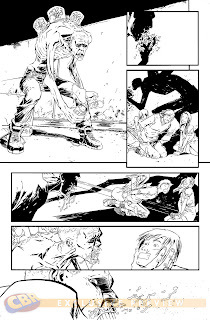 As one of the few Irish guys working on more mainstream titles, I thought I might impart a little advice to artists attending the show (as well as show some OLD art, so you can see what I have had in my own portfolio in the past). I've been to Comic Conventions in Ireland, the UK, the States, etc, and I reckon I've learned a lot from all those experiences. As I said; five US editors. 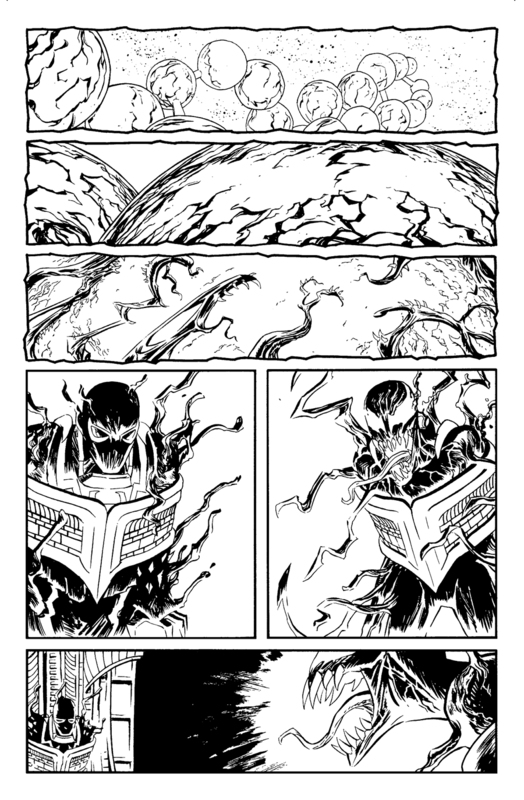 If you are showing a superhero publisher your horror story, you may not get the response you're looking for. 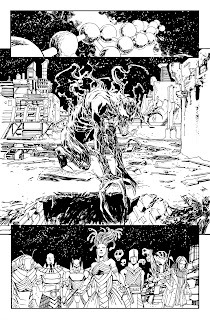 There's no reason you can't show them your horror story; but if they publish superheroes then show them some superheroes too. Otherwise, they can always say to you 'It's nice work, but I don't see any superheroes'. Don't give them that option, besides, they're totally right to say that. They might see you are talented, but they wouldn't be able to see how you work within their specific genre. I was considering naming the books that each editor attending works on, but to be fair, you can look it up yourself; in this Google Age we live in it's not that hard and if you're not willing to go to that little bit of effort, then what's the point? I'm not suggesting you tailor your portfolio to each editor; just that you need to make sure you're not wasting your (or the editor's) time. Helpful suggestion; There will be Marvel (superhero) editors and a Vertigo (mature readers) editor at DICE. You could kill two birds with one stone and have a Marvel superhero in some kind of real-world drama. That way, it could suit both editors. That's what I would do, at least. My first piece of advice would be to display your work in an actual portfolio. Doesn't have to be expensive, just something to keep your work presentable. DO NOT hand up sketchbooks for portfolio reviews. Sketchbooks are for sketches; keep them for yourself. This is essentially a job interview; don't hand in essentially a CV with doodles scribbled on the end. 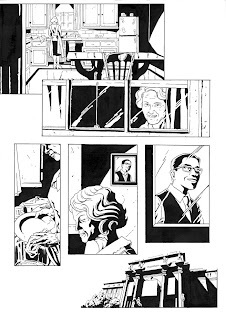 Also, have panel borders around the edge of your pages, that is, don't draw all the way off the page; no actual comics artist does that and it makes your pages look more amateurish because of it. The amount of work you show is important In my opinion; no less than 6 pages is satisfactory for a portfolio review. Any less than that looks lacklustre. On the other side, no more than 12 pages is acceptable. When a portfolio has more than that, the editor will just get tired on page one and not give any of the other pages the proper attention. If you agreed to read someones poem and they gave you a novel; that's how they'll feel. 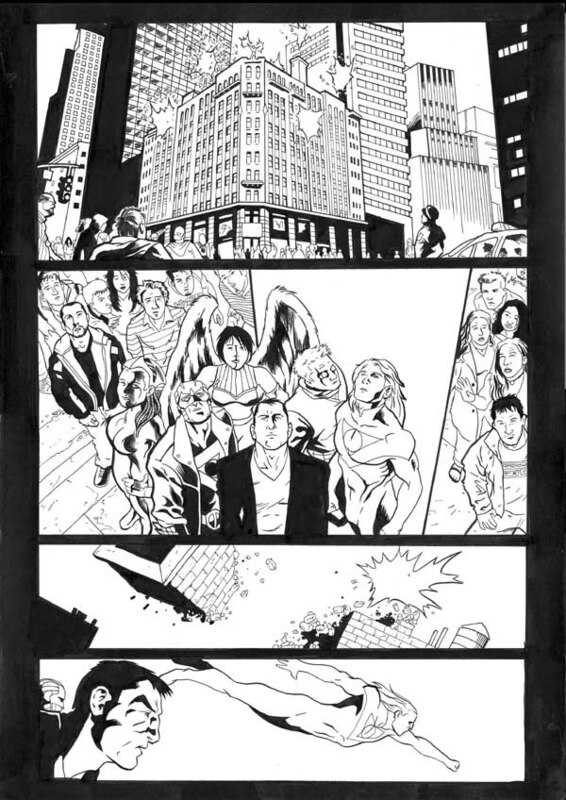 12 pages gives you enough space to show a range of characters and genres without exhausting the editors. To be honest, it's probably best to have 8 or 10 pages, but no more than 12! IMPRESS AT THE START. AND END. Always start your portfolio with your BEST page. You want to grab an editors attention straight away. That way, they will take the time to properly look at the rest of the portfolio. Generally, you would want to have your most recent work at the front for the same reason. On top of that, I find it helpful to save a really good piece until the very end. If you can punctuate your portfolio with an impressive piece, I found that editors will actually look through the portfolio in reverse, as if the last piece is the first piece, giving them a reason to look through your portfolio again with a somewhat fresher perspective. As I said above, DICE is in less than 30 days. 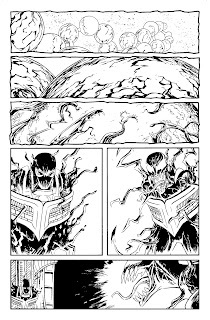 In that space of time I will have pencilled and inked an issue of VENOM. Ideally, I would have 5-6 weeks, but sometimes you have to buckle down and get the work done. 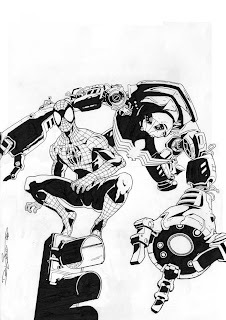 To be frank, if you can't have a professional-looking portfolio prepared in this space of time, then you are simply not ready for working in mainstream comics. Take this as a challenge; get your portfolio together in time for the show! Some of you want to pencil, some of you want to Ink. It's best to show your work in the medium you want to work in, if possible. 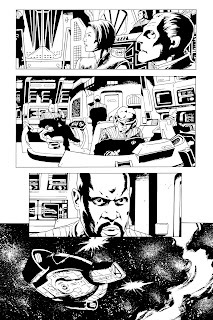 I pencil and ink my own work, so that's worked to my advantage, but if you want to only pencil, then you should have pencilled pages in your portfolio. If you want to only ink; show your ink work on different pencillers. Same goes for colouring. Much like knowing what medium you want to work in, it's best to know what type of work you want. 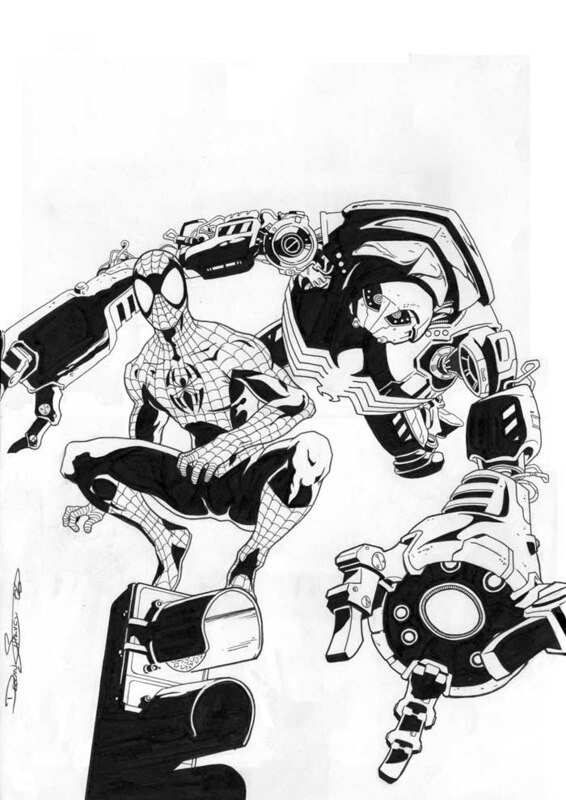 if you want to be a cover artist, your portfolio should contain lots of covers. 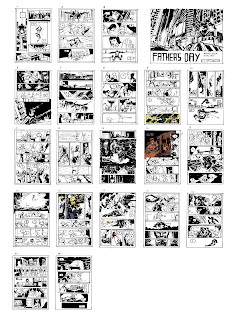 If you want to draw sequential stories, then have storytelling pages in your portfolio. 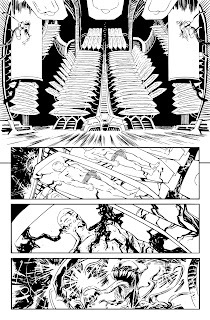 I think you can get away with a cover piece to show off a little, but comics editors are generally looking for comics artists and that means storytelling pages are a must. As helpful as editors have been to me in the past, some have been no help at all (though I'm positive all the editors at DICE will be GREAT). By showing your work to guests at the show, you are likely to get a LOT of valuable information from those who have built successfull careers in the freelance trenches. Most will be more than happy to impart vital nuggets of wisdom. Realistically, it is very unlikely that an editor will see your work and snap you up with an exclusive contract. Probably won't happen. But if you show a solid portfolio and impress a couple of editors, you can build on that relationship that may lead to a career in the mainstream in the future. Think long-term. See this as a step in the right direction. I'd like to think this is obvious, but it just doesn't look good. Don't do it. Be cool. Guys, I know this is aimed at artists, but it's what I know. 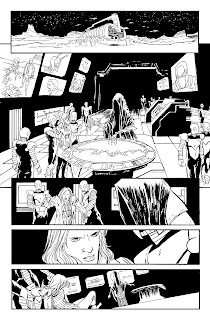 If your goal is to write for mainstream comics, then the best thing you can do is give the editors actual comics that you have already published. It shows that you can write a comic, and it also protects them from any later legal concerns. They simply cannot read your scripts. All you can do is buy them a pint and have a chat with them. 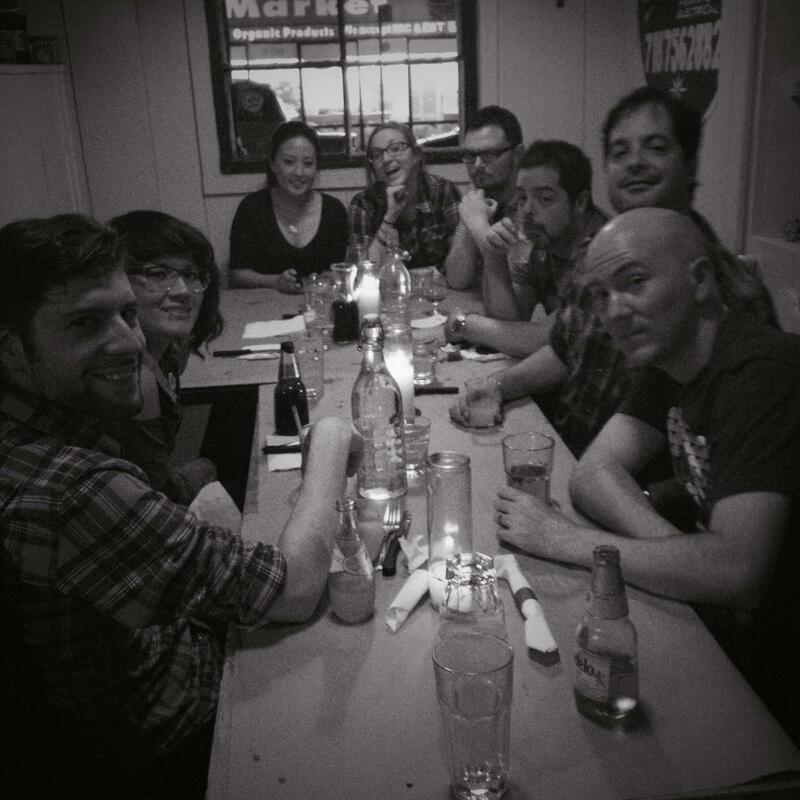 If you're serious about writing comics, you should already be planning to come to DICE and network with artists. Fairly obvious, right? Still though, worth saying. I hope this is all helpful. Any questions, ask away in the comments. This is all just my opinion but at this stage I'd like to think it's a pretty well informed opinion. 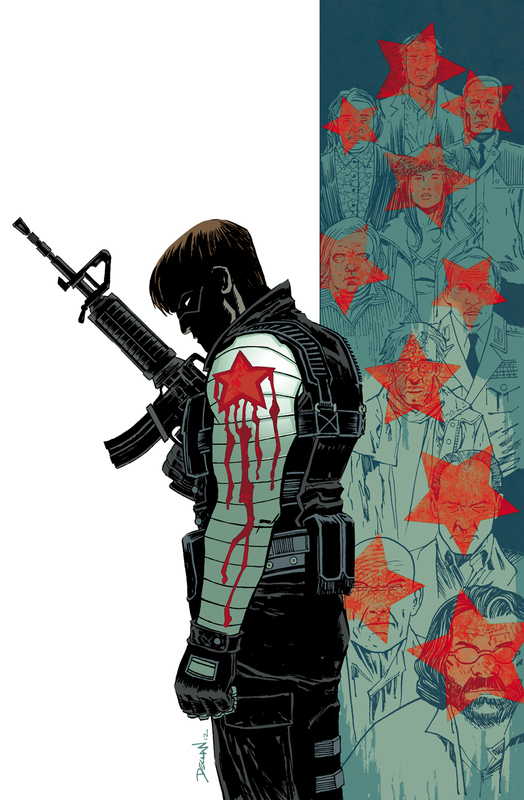 It was just announced at FanExpo in Toronto that Jason Latour is taking over writing duties on WINTER SOLDIER. 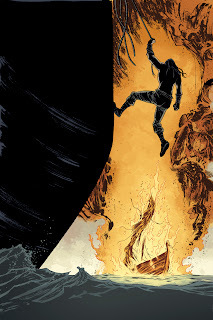 I'm happy to report that I'm providing covers for his first arc with the excellent colour work of Jordie Bellaire. Above is the cover for issue 15, our first issue. 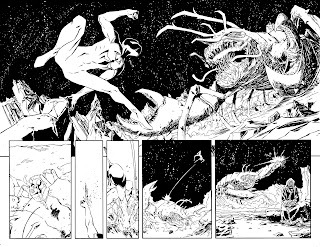 MINIMUM CARNAGE – PART FIVE! 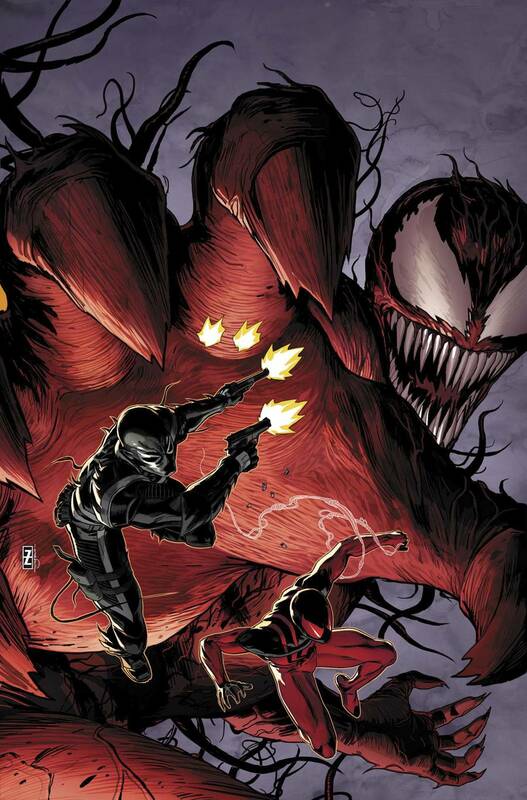 • Venom, Scarlet Spider and the Micronauts fight to save a universe – but in the process, have doomed our own! • Cullen Bunn and Declan Shalvey bring you the pentultimate chapter of the mega-levolent masterpiece! I was recently interviewed on Newsarama about starting on VENOM, the upcoming 'Minimum Carnage' crossover and I'm sure I moan about something or other. You can read it here. 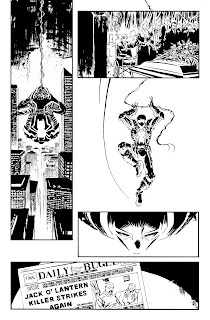 Also, when on T-Bolts and Dark Avengers, writer Jeff Parker had a great response when he posted my layouts so I thought I might start doing the same here, with my Venom layouts. 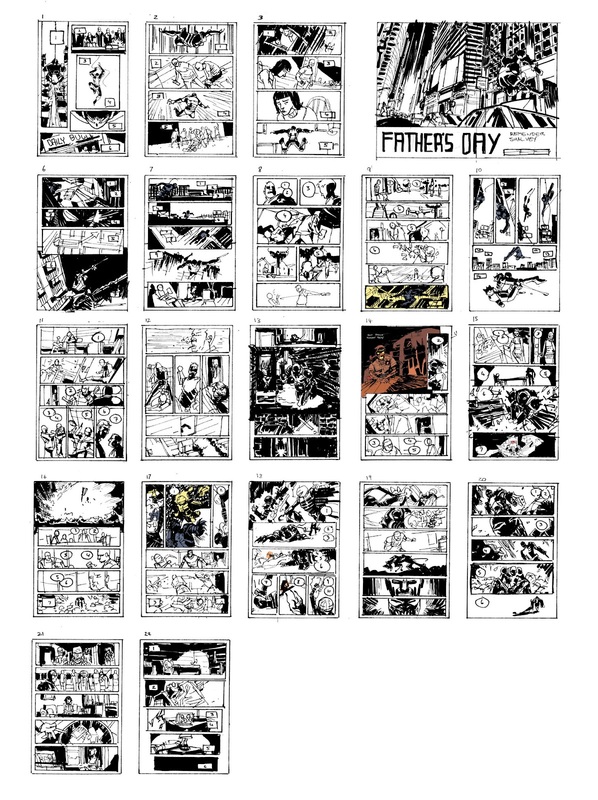 So, here are my layouts for the whole of issue 22 of Venom. Ask away in the comments if you have any questions and I'll do my best to answer them. A preview for my first issue of VENOM is online. 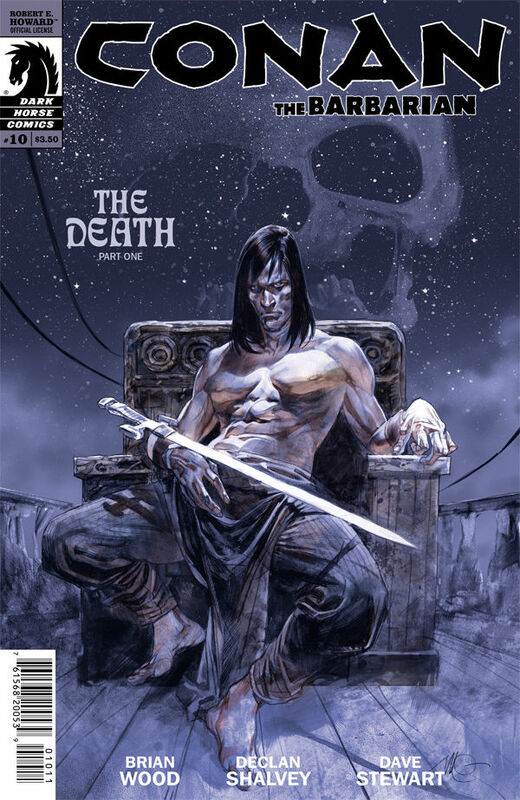 Also happens to be Rick Remender's final issue, so it's not to be missed! Really happy with this issue; definitely my best work to date. 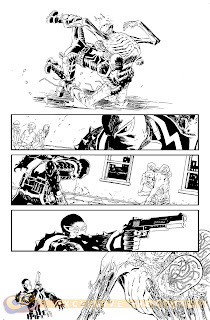 You can see the preview with all the fantastic Lee Loughridge (Punisher Max) colours here. VENOM #22 OUT TODAY! Dec.